Last Saturday, the 7th of March, the recently refurbished AREN Mobile Command Post was commissioned. More information on the work and background will be in the upcoming Echo Ireland, the Journal of the Irish Radio Transmitters Society. It is planned to have the MCP at the IRTS AGM the weekend of the 25th/26th of April. 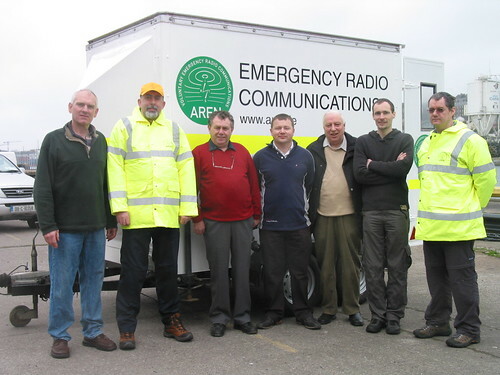 Pictured above are Tim, EI5GPB, John EI2GN, Dave EI4BZ, Conor EI4JN, IRTS President Finbarr EI1CS, Laurent EI8JV and John EI7IG. Posted in 2009, activities, news | Comments Off on Trailer Commissioning.